This week Kerri-Anne Kennerley made news headlines after announcing that she discovered a small tumour “no bigger than a pea” in her breast. The support she has been receiving is amazing, she is a much loved lady. One of the aspects of cancer treatment that doesn’t get much attention is skin care. Both chemotherapy and radiation therapy ravage the skin, often leaving cancer patients feeling very self-conscious. Today I want to share with you a story about a friend of ours – Anne – who we have been able to help. Some months ago, Anne contacted us for some advice as she was undergoing chemotherapy and struggling with the dry skin side effects. Anne opened our eyes to the special requirements of people undergoing chemo and radiation therapy. 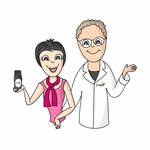 After Anne’s success it was only natural that we make more of the Intensive Repair Oil and help others just like Anne. Click here to find out more about the Intensive Repair Oil, or call us now on (02) 4957 5774. We would love to hear from you. The post Cancer treatments can cause massive skin damage, but help is out there appeared first on Happy Skincare.